Mists of Avalon meets Philippa Gregory in the first book of an exciting historical trilogy that reveals the untold story of Languoreth—a powerful and, until now, tragically forgotten queen of sixth-century Scotland—twin sister of the man who inspired the legendary character of Merlin. Intelligent, passionate, rebellious, and brave, Languoreth is the unforgettable heroine of The Lost Queen, a tale of conflicted loves and survival set against the cinematic backdrop of ancient Scotland, a magical land of myths and superstition inspired by the beauty of the natural world. One of the most powerful early medieval queens in British history, Languoreth ruled at a time of enormous disruption and bloodshed, when the burgeoning forces of Christianity threatened to obliterate the ancient pagan beliefs and change her way of life forever. Together with her twin brother Lailoken, a warrior and druid known to history as Merlin, Languoreth is catapulted into a world of danger and violence. When a war brings the hero Emrys Pendragon, to their door, Languoreth collides with the handsome warrior Maelgwn. Their passionate connection is forged by enchantment, but Languoreth is promised in marriage to Rhydderch, son of the High King who is sympathetic to the followers of Christianity. As Rhydderch's wife, Languoreth must assume her duty to fight for the preservation of the Old Way, her kingdom, and all she holds dear. The Lost Queen brings this remarkable woman to life—rescuing her from obscurity, and reaffirming her place at the center of the most enduring legends of all time. 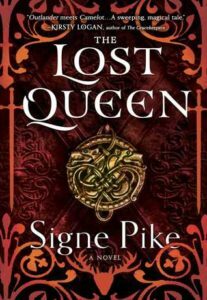 Signe Pike’s The Lost Queen was everything I’d been craving in a historical fiction (with a hint of fantasy) novel. Set in 6th-century Celtic Britain, Pike weaves historical details with Arthurian legends and manages to bring a vivid creation of a young woman’s life to the page. Languoreth is the oft-forgotten twin sister of Lailoken, a warrior and a wisdom keeper who was later known as Merlin. In this first installment of a trilogy, we’re given an insight of Languoreth’s childhood through first love and subsequent marriage, all while the followers of a newly-introduced religion threaten to disrupt life as she and her people know it. Languoreth and Lailoken are born with gifts and raised in the Old Ways by their mother before her death; and as much as Languoreth would like to follow in her mother’s footsteps as a healer and a wisdom keeper, her father has plans for her to marry to secure an alliance. Even though this novel takes place in the mid-500s, the choices with which Languoreth is faced are immediate, real, and are similar to choices women face today. This first installment in the trilogy is less about Languoreth’s role in Lailoken’s life as it is about her role in becoming a powerful queen, taking charge of the choices she made, and forging her way through a man’s world. This first novel of a trilogy is rich and engaging, and it sets up for what I hope are brilliant examinations of early Scottish/Celtic life with the invasion of Christianity. I already love the glimpses of day-to-day life in those early courts, and I felt like I was right there next to Languoreth as she experienced everything. I can’t wait to see what happens next with Languoreth, Lailoken, and Pike’s further reimagining of the Arthurian legends. The next one isn’t out until 2020! That’s so far away!! But if you’re looking for something to fill the void between Outlander, Game of Thrones, and Mists of Avalon, definitely check this one out. Many thanks to Touchstone for sending me a complementary copy to review! All opinions are my own.